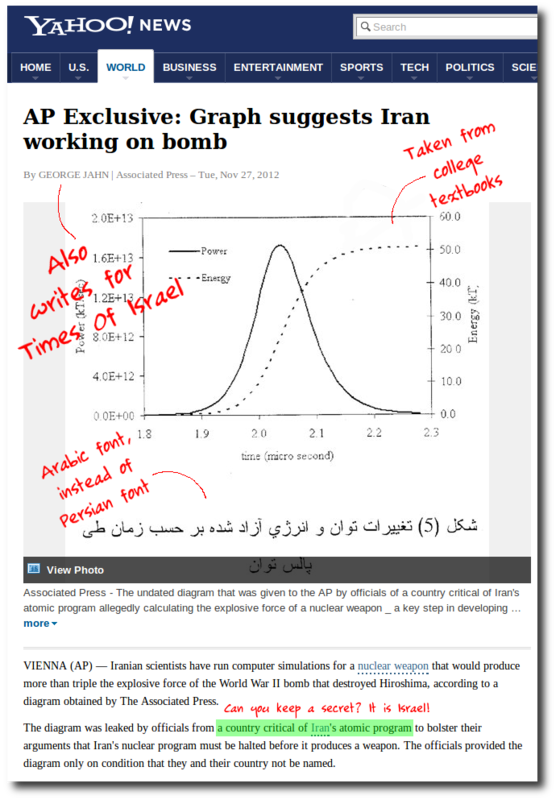 In November last year, AP reporter George Jahn, who also writes for Times of Israel, produced this diagram as having been leaked by “a country critical” of Israel” as the proof of Iran’s alleged nuclear program. This was such an obvious piece of shoddy propaganda that the report was panned by nuclear scientists and prominent Israel watchers. 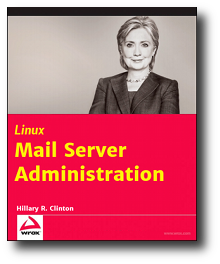 Unfortunately, most Americans were bombarded by the original report, not the subsequent critical review. Most of the time, Americans have no way of telling propaganda from real news. Almost all of the media are owned by Rothschild fronts. Independent voices are bought over or infiltrated and destroyed from within. 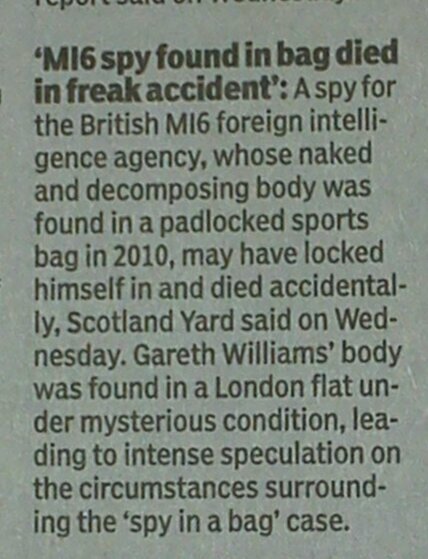 MI6 spy went into a sports bag and then locked himself, Rothschild’s London Police say. 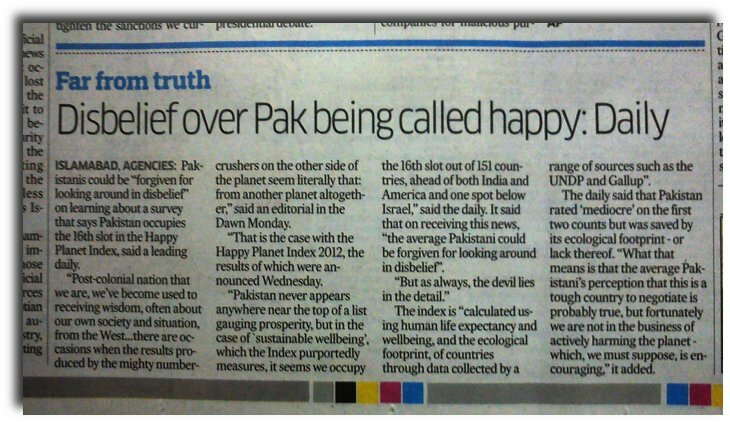 Deccan Herald: Pakistanis express surprise over a survey that claimed that they were the “happiest” people in the world. Pakistan suffers from almost weekly mosque shootings and bazaar bombings, in addition to illegal US drone strikes. Yet, they are considered the happiest. 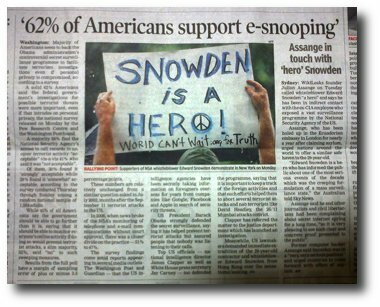 In the aftermath of the NSA surveillance scandal, news organizations conducted a survey to claim that a majority of Americans support surveillance. News reports reguarlly question the sanity of those who are opposed to vaccines. Have they ever looked at the raw data? Thousands of paralysis attacks. Unlike the Injectable Polio Vaccine (IPV), the Oral Polio Vaccine (OPV) promoted by Bill Gates Foundation contains live but “attenuated” viruses. The body structure viruses are so basic that you can barely tell if it is alive! Thousands of children suffering from paralsysis after receiving polio vaccine. The World Health Organization (WHO) lies about how the polio vaccine works. 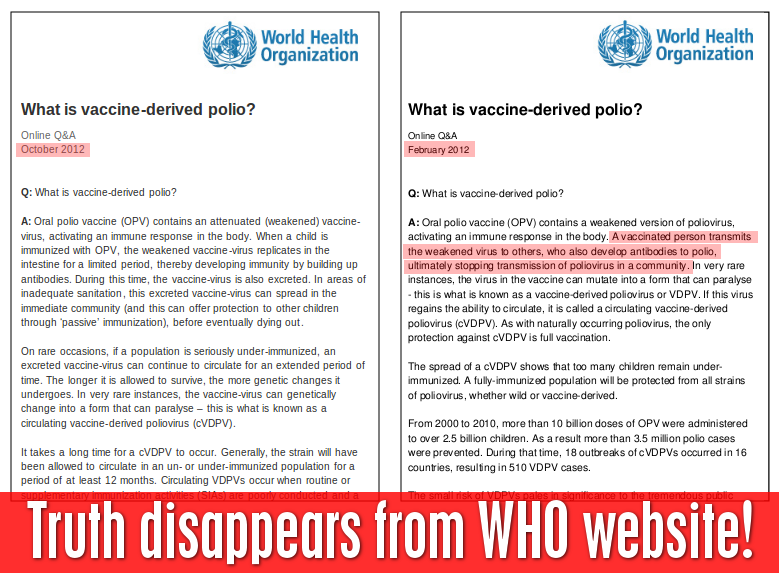 WHO website removes information on how the vaccinated individuals infect non-vaccinated people and then claims that it is passed around through contamination. Kids who become paralytic after getting a polio vaccine are supposed to have acquired NON-POLIO ACUTE FLACCID PARALYSIS (NVD AFP). These cases are discarded wholesale as they are deemed not to be VACCINE-DERIVED POLIOVIRUS (NVDPV). When infants die from vaccines, it is called SUDDEN INFANT DEATH SYNDROME. These deaths are either ignored or worse, their parents are accused of violently shaking the children and killing them. Doctors and researchers will come to any conclusion in the name of SCIENCE! This health news says alcohol is good for health. 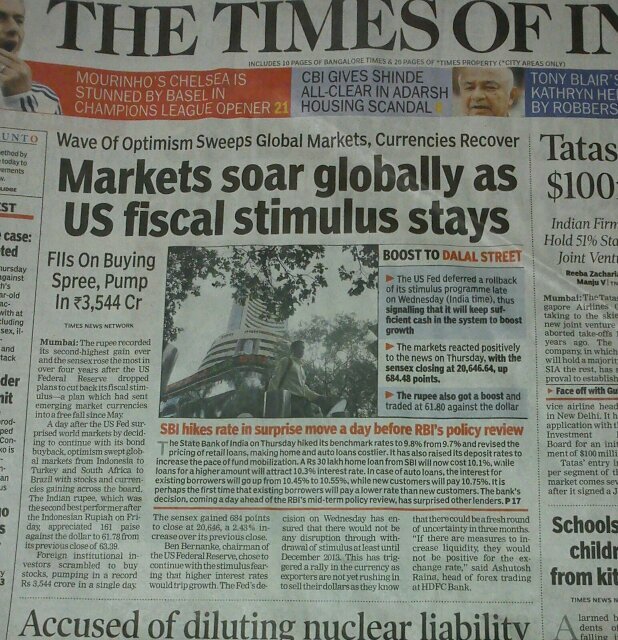 Financial markets all over the world are addicted to money printing or debasement of currency. Even a public utility like the BBC pays big money to silence potential whistleblowers. 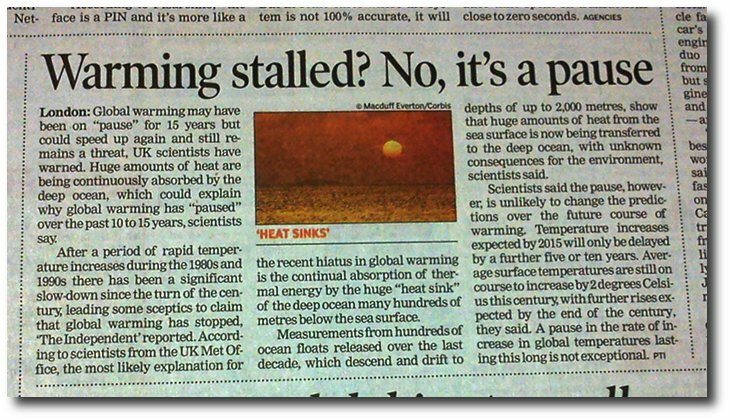 Climate Scientologists wrestle with evidence claiming that global temperatures have actually fallen. 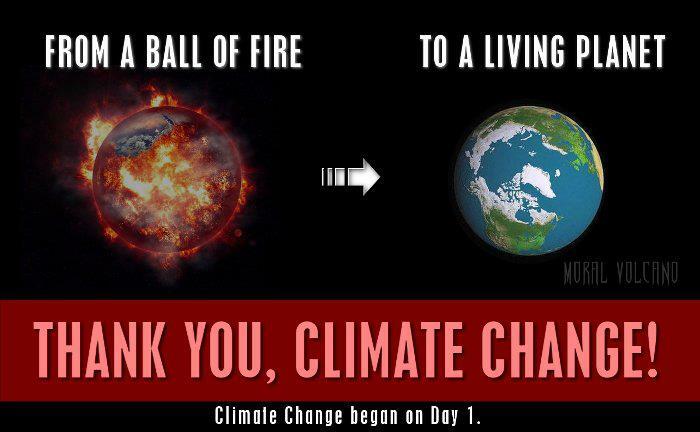 Earth turned to a living planet thanks to Climate Change. News and PR organisations work hand-in-hand. They can make night as day and vice versa. 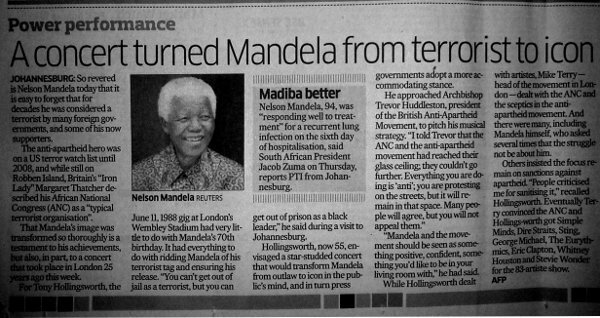 Mandela was for long a Communist terrorist. 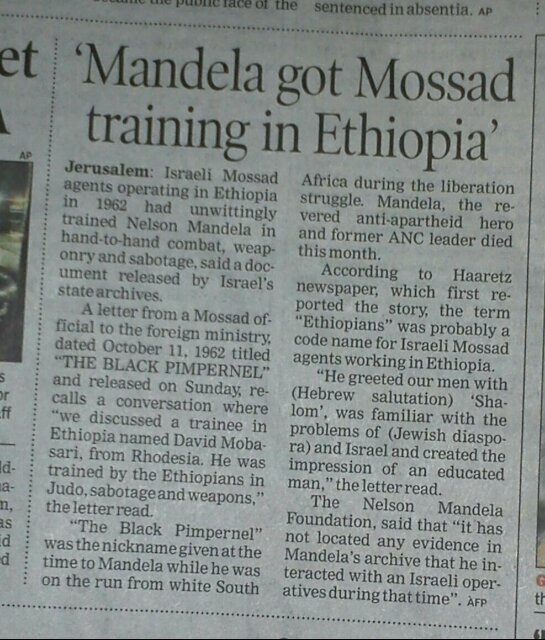 From Abraham Lincoln to Mandela to Obama, manipulating the memory of the past is the prime objective of the globalists. This article was published in a “medical ethics” journal of the British Medical Journal.